When my nieces and nephew were little, my parents lived on a farm and they absolutely loved coming to grandma and grandpa’s farm to visit! They were excited to see all the different animals, delighted when they got to pet some of them, thrilled when grandpa took them for a ride on the ‘big tractor’ and loved playing on the bales. And when they were done playing outside, they’d come in and grandma would give them buckets full of all kinds of wonderful farm toys. They’d hunker down and play with those toys for hours, coming up with all kinds of pretend play scenarios and creative stories. There’s just something magical for kids of all ages when it comes to farms. Because we know how popular farm toys are with kids and how much they love them, we decided to hit the books so that we could present you with this list of the best farm toys for toddlers! You’ll find cool tractors, charming farm animals, barns that make cute animal sounds and lots more! We’ve even got some fun kids books about the farm and great farm toy accessories, such as an animal feeding set and a talking John Deere toolbelt. So if you’ve got a farm loving child on your shopping list, any of the awesome toddler farm toys on our list are sure to be a hit, no matter what the gift-giving occasion! 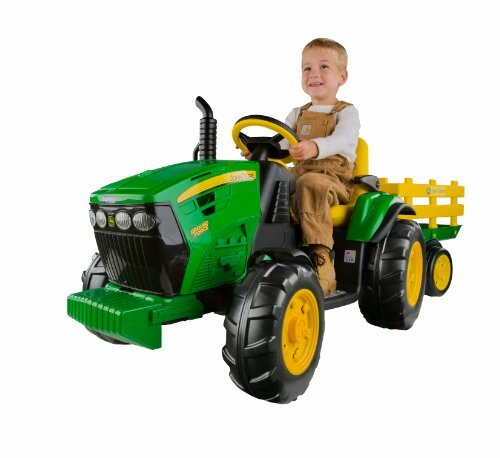 Your child will be thrilled riding around on the Peg Perego John Deere Ground Force Tractor! This awesome ride on tractor comes with a full size detachable stake-side trailer, accelerator pedal, and heavy duty farm tractor wheels. It has two running speeds, 2 ½ mph or 4 mph, and has a parental control so you can control how fast your child goes. In fact, you can actually lock out the higher gear, ensuring your child doesn’t go any faster than 2 ½ mph. Another great safety feature is the automatic stop; as soon as your child takes their foot off the accelerator pedal, the tractor comes to a stop. This cool John Deere ride on tractor can go forward and in reverse. And the heavy duty wheels give your child a smooth comfortable ride and allow them to go on just about any surface, including grass, dirt, pavement and gravel. To add to its appeal, it has an adjustable seat with flip-up arm rests and a working FM radio. Made in the USA, both the 12 volt battery needed to run this run ride on tractor and the battery charger are included. Most parents find that this tractor takes about an hour or two to assemble, including the putting on the neat stickers that come with it. Your child will love loading up the trailer and driving their load from one destination to another. Or you may find them putting that play rake and shovel in the trailer so they can help you with yard work or gardening. Designed for kids 3-7 years old, this ride on tractor can hold up to 85 lbs. It’s packed with features and designed with your child’s safety in mind. This Peg Prego John Deere Tractor makes every outing a fun adventure and your child is sure to have hours of fun on it! Kids think it’s a blast to ride on! These John Deere Sandbox Vehicles are a great introduction or addition to your toddler’s car, truck and construction vehicle set! This package of 2 includes a tractor with a front end loader that moves up and down, and a dump truck with a bed that tips up and dumps. Plus they have free rolling wheels, so your child can have fun pushing them around. Both vehicles are made of sturdy plastic and come in the traditional John Deere green and yellow. Each one measures about 6″ high, so they’re the perfect size for your toddler’s small hands. Recommended for kids 18+ months, they’re designed to be used in the house, sandbox, or at the beach. But no matter where you toddler plays with them, they’ll have great fun building roads, sand castles and more. They can even use it to move kinetic sand when playing indoors. Best of all with 2 vehicles you child can play with a friend! Kids think they’re tons of fun to play with! 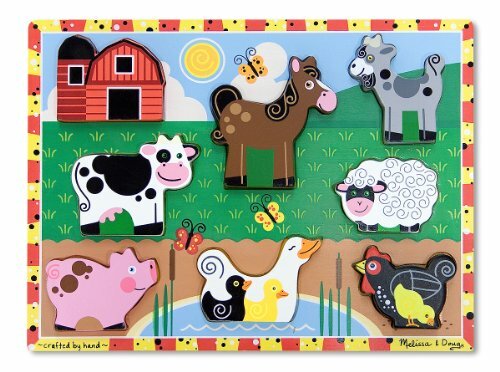 The Melissa & Doug Farm Wooden Chunky Puzzle is like providing your child with 2 toys in one. This 8 piece puzzle measures 11″ X 8.2″ and comes with a barn plus 7 animals, including a sheep, pig, goat, and more. When removed, each puzzle piece stands up on its own so your child can play with the animals themselves without actually doing the puzzle. There are full color pictures of each piece printed on the puzzle bed allowing your child to match the puzzle piece with the shape it fits in. The puzzle pieces fit little hands and since they are made of wood they are quite durable and able to stand up for both play and for working the puzzle. Designed for children ages 2 years and up, you could use this puzzle to help your toddler learn the names of common farm animals, as well as the sounds they make. This Melissa and Doug Farm Puzzle makes a wonderful gift for your child and is a great way to introduce them to puzzles. It’s fun to put together! The Fisher-Price Little People Caring For Animals Farm Set will provide your child with hours of imaginative fun! 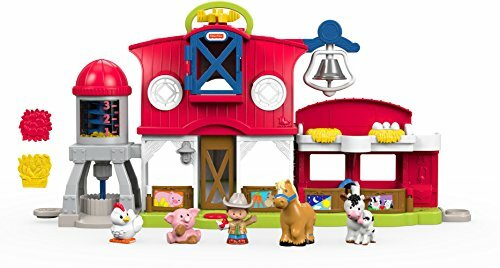 This awesome play set includes a cute little barn, farmer Jed, a pig, a chicken, a horse and a cow with her calf. 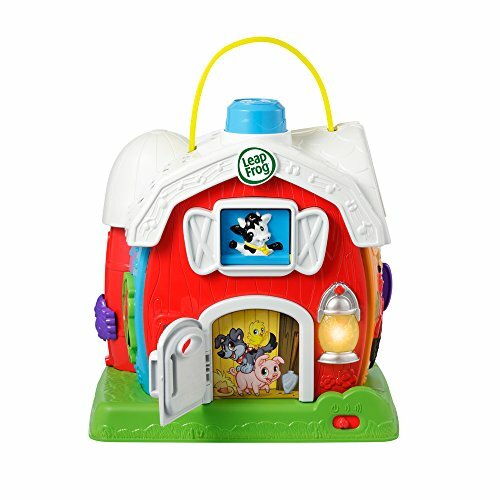 There are lots of fun activities for your child to explore and discover with this farm set, including barn and stall doors that open and close and lights that turn on and off at the push of a button. By pressing a button or dropping one of the figures down through the barn from the hay loft, they can hear cute sounds and songs. Rotating the silo activates cool popping sounds, or they can ring the bell when it’s time for the animals to eat. Pushing another button allows them to “hatch’ the chicks from their eggs and when it’s bedtime, they can cover the cow up with her blanket. This delightful Fisher Price Animal Farm Set has everything your toddler needs to take care of the animals, including two kinds of food. The animals are the perfect size for little hands and the entire set is made from durable plastic. Designed for kids 1 to 5 years old, this play set takes 2 AA batteries (not included). Your child will have a great time helping farmer Jed with all his chores: Feeding the animals, taking them in and out of the stalls, and putting them to bed when it’s time for them to sleep. Kids think it’s lot of fun! 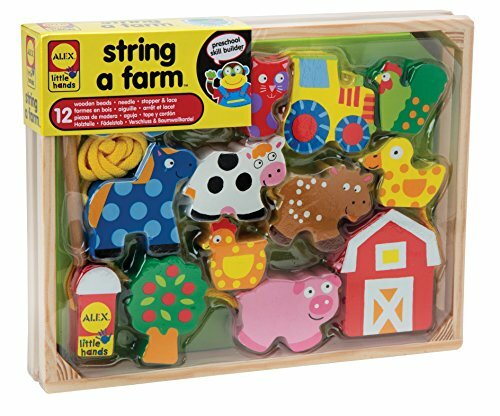 The award-winning ALEX Toys Little Hands String A Farm is a fun activity that’s great for older toddlers and preschool age kids. This craft kit consists of 12 cute farm-themed wooden beads, including a chicken, a duck, a cow, a pig, a barn, a sheep, a tractor, and more. It also comes with a cotton lacing string, a fire hydrant stopper, and a wooden stringing needle. The wooden needle has a rounded tip so it won’t poke your child when they’re stringing the beads. All your child has to do is feed the string through the wooden needle and then lace it through each of the wooden beads. Your child will be delighted once they complete the activity and see the cute little farm collection they’ve created. Plus they can lace the wooden beads in any order they want, so they can make a different collection each time they use the kit. And for even more fun, the large, chunky wooden beads will stand up on their own, allowing your child to play with them independently. The String A Farm is a wonderful way for your child to develop some important skills, such as fine motor skills, counting skills and sequencing skills. It also helps your toddler improve their hand-eye coordination. Used by both occupational and physical therapists, this ALEX toys wooden stringing set is recommended for kids 3-5 years old. However, several parents state that children as young as 14 or 15 months were also able to do this activity with supervision. Although this kit doesn’t come with a storage container, that problem is easy to solve simply by using a zip lock bag to store everything. This fun set is a great way for your child to spend some time developing their skills, and they’ll be happy to string the beads over and over again, creating something different each time! Kids think it’s tons of fun! This LeapFrog Sing and Play Farm is an excellent toy for older infants and young toddlers. The Sing and Play farm has a lot of things for your child to explore, including 5 interactive play areas with buttons to push, switches to flip, and keys to turn. There are also fun sounds, cute melodies to discover and enjoy. Your child can turn a key and get tractor engine sounds. They can play peek-a-boo with owl that will ask them questions, and there is spider slide and a hopping bunny, 13 different animals in all. You child will learn different animal names and sounds, songs, colors and even vegetables all while having a lot of fun and exploring. The great thing about this Sing and Play Farm is that as your child gets older, they will discover new areas and ways of playing with this toy so they won’t grow tired of this toy for a couple of years. Young children like that the different animals sing, giggle and ask them questions and several parents shared that this LeapFrog toy is their toddler’s favorite and they play with it for hours! Recommended for children ages 6 months to 3 years, this play farm is a learning toy and a wonderful way for your child to engage their senses and explore different farm activities. Your child will have tons of fun exploring all the different buttons, switches, slides and keys! Excellent educational toy to help your child learn about animals, their sounds, music, rhythm and more! This Melissa and Doug Hide And Seek Farm Activity Board is a fun and educational toy for your child. This board is constructed of wood and has nine different doors for your child to open. Behind each door is a coated cardboard magnetic farm animal. Each farm animal is removable. The animals included in this peek a boo activity board is a cow, horse, pig, sheep, rabbit, and chicken. This activity board is recommended for children ages 3 to 5, but many parents find it works for much younger children as long as the parent surpervises and plays with the child. With the help of a parent or older sibling there are a variety of different ways to use this activity board for learning fun. This activity board can be used as memory game. You can give your child the name of one of the animals and have them choose the door the animal is behind. It can be used to help your child learn the names of various animals and the sounds they make. 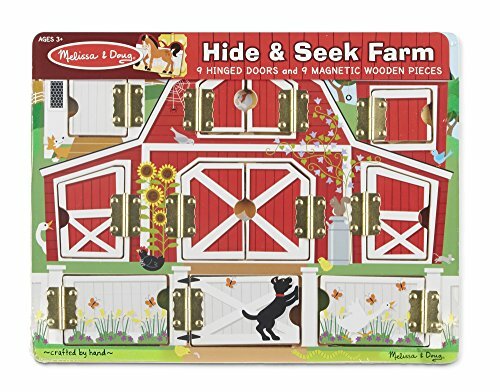 This Melissa and Doug Hide and Seek Farm Wooden Activity Board will be appealing to young children who love playing peek a boo and who enjoy farm animals. A number of parents shared that their toddler loves opening the doors to see what animal was behind each one and it great helped improve their cognitive skills while having fun. They also mentioned that it was a favorite farm toy gift for Christmas and birthdays and never fails to impress. Your child will have loads of fun opening the barns doors and taking out the different animals! This award winning Green Toys Tractor With Trailer will give your toddler hours of pretend farm play fun! It comes in your choice or orange or pink and can be used for both indoor and outdoor play. The trailer is detachable and is easy for small hands to take on and off, making it tons of fun for your child to load and unload their cargo. The durable chunky tires can go on any terrain and it has no metal axels, so it’s perfectly safe for small kids. The tractor and trailer combined measure 11.75″ X 5.4″ X 4.8″ and best of all, it’s dishwasher safe so clean up is a breeze. 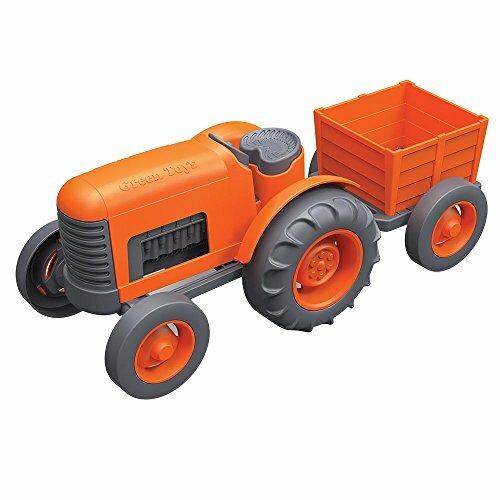 Like all Green Toys, this sturdy tractor is made in the USA from recycled plastic milk cartoons. It’s also BPA and Phthalate free, so in addition to being a great toy, it’s also a wonderful way to teach your kids about how to be eco-friendly. Your child can enjoy playing with this cute little farm toy anywhere, including in the sandbox, at the beach or in the house. Whether they’re hauling around dirt, rocks, sand or toys, they’ll have endless imaginary play scenarios with this easy to roll tractor and trailer. 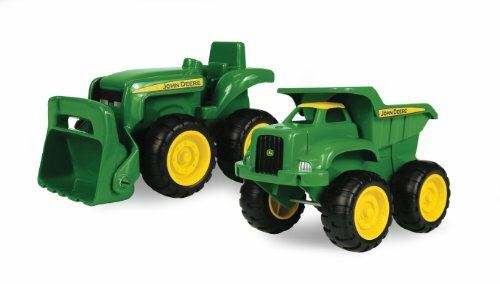 This awesome Green Toys Tractor is a great toy to play with alone or in combination with other farm toys or sets. It’s a wonderful toy for young toddlers and makes a perfect first vehicle for your child. Kids think it’s tons of fun to play with! 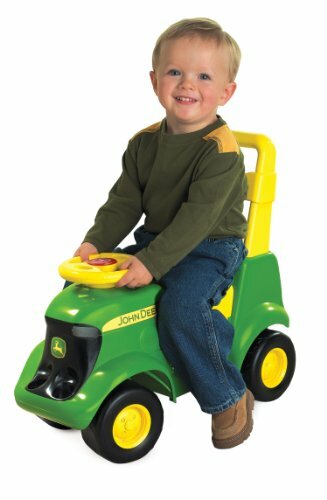 This awesome John Deere Sit ‘N Scoot Activity Tractor is a great way to make learning tons of fun for your child! Its unique 3-way function makes it very versatile. Younger kids who are still unsteady on their feet can stand behind, hold onto the back handle and use it as a walker. Older toddlers can sit on the seat and scoot around. Or you can hold onto the back handle and push your child around. But the best thing about this little farm toy is all the different sounds and activities your child can explore and discover. There’s a flip-down activity center that contains 4 cute little farm animals: a sheep, pig, horse and car. How fun will it be for your toddler to take the entire the farm with him as they scoots around on the tractor! Plus your child will have fun discovering that when they place the right farm animal into the right space, they’ll hear that animal’s sound. And there are several places on the tractor that your child can hide the animals. Another great feature is that your child can play “Old McDonald” when they push on the horn. Parents love that there are 2 volume settings and an off switch so you can not only control the volume, you can even turn the sounds right off if you need a break. This John Deere Activity Tractor is recommended for children 1 to 5 years of age, and requires 3 AAA batteries, which are not included. It’s an enjoyable walking or ride-on toy that offers your child a variety of fun things to do and encourages them to stretch their imagination during play. Lots of fun for your child! The Fisher-Price Little People Tow ‘N Pull Tractor offers your toddler or pre-schooler a handy toy for playing farm. This set comes with a tractor, trailer, farmer, cow, and a pig that pops up and down in the hay as the tractor moves. The tractor uses 2AA batteries and is equipped with 25 sounds, songs, and phrases to keep your child giggling and learning. Recommended for children age 1 through 5, this tractor farm playset is great fun for small children. Place the farmer in the seat and press down on him and he will play a song. Give the pig and the cow a ride in the back of the trailer. Do keep in mind that the trailer and the tractor are attached to one another so your child can’t separate them. 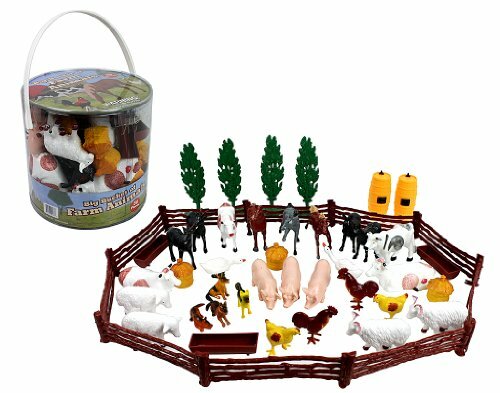 This is a great starter farm set, and you can add to this set to provide your child with even more fun. The Fisher-Price Tow ‘N Pull Tractor is sure to be a huge hit with any child who loves tractors, vehicles or the idea of farming! Provides your little one with hours of great fun, playing with the tractor, trailer, farmer and animals! This Melissa and Doug Take Along Show Horse Stable is the perfect toy for any little girl or boy who love horses. The stable is made from wood and has a handle that makes it easy to transport from one room or location to another. Each of the stable doors close and latch. The set also comes with 8 horses, with each horse being of a different breed. The stable also comes with some basic facts regarding the horses, and name tags that allow your child to name each of their horses. Although made from plastic, the horses have a slightly fuzzy coating. The stable is designed to fit horses that range in size between 3.5 inches and 4 inches (Fits Beyer Stable Mates). This Show-Horse Stable is sure to inspire different activities. Your child can use their building blocks to build a fence, put their horses out to graze, or pretend that their horses are wild horses racing across the plains. These horses are great for children of both sexes, and with 8 horses available, this stable set is fun for your child to play with another child or two. 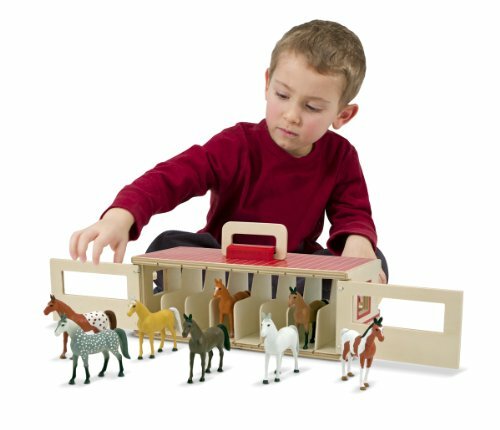 This cute little stable with 8 horses is a great toy for any toddler or pre-schooler who loves horses and wants to engage in imaginative play. This cute little John Deere Fun On The Farm Playset comes with 20 pieces including a combine, tractor, front end loader, a couple of farmers, a fence, sheep, a horse, a cow and a chicken. Made of sturdy plastic, this farm set is recommended for children age 18 months and up, but several parents shared that they found that this play set works well for children as young as one. Children like that all of the vehicles have movable parts. Parents like that this farm play set really gets their child’s creative juices flowing as they often use it in conjunction with building sets, such as Lincoln logs to build a barn, corrals and other buildings to house the animals or machinery. This is a great farm set for your child to use on their own or to invite a friend to play with, since there are several vehicles and 2 farmers, so sharing is easy. Although the animals that come with this set aren’t very realistic, your child will easily be able to recognize each individual animal. This John Deere Farm Play Set makes a great birthday or Christmas gift and is sure to provide hours of fun for your toddler or preschooler. More vehicles, more farmers, and a whole lot more fun for your little one! This Melissa and Doug Fold and Go Barn is a great little farm barn playset that is portable enough for your child to take anywhere. The barn comes with 7 different animals, a horse, cow, pig, goat, turkey, sheep and dog. It also comes with sliding doors and carrying handles and is constructed of wood while the animals are made from durable plastic. One of the nice things about this barn is that your child can add other farm animals to the barn as long as they are under 3 inches high. Not only does the barn door open, but each of the interior stalls open as well, so your child can get the feeling of what a real barn may be like. The barn can also serve as a learning toy since children can learn the names of the animals and the sounds that they make. This Melissa & Doug Fold ‘N Go Barn set would make a great Christmas gift, or can be used as a gift for a farm themed birthday. It’s ideal for children ages 3 to 5, but several parents shared that their children as young as 2 love this barn and the accompanying animals. Along with the best farm toys, we thought it would be fun to include a few of the most popular farm books for toddlers. These books make it enjoyable for your child to learn all about farm animals, the sounds they make, and lots more. Any of these books are a perfect compliment to all of the wonderful farm toys for toddlers on our list! 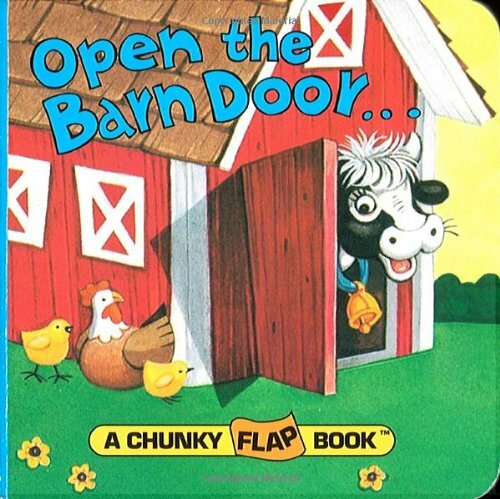 Open the Barn Door By Christopher Santoro is a simple book that holds an exciting surprise for your child to discover behind every flap! A wonderful chunky book, each page asks a question and then your child lifts a flap to find out the answer. Not only do kids love lifting the flaps, it’s also a great way to help your child learn the names of common farm animals and the sounds that they make. It should be noted that this book measures only about 4 inches, which can make it difficult for smaller children to work the flaps. However, kids who are 14 or 15 months or older seem to have no difficulty looking at the book and opening the flaps by themselves. The upside of a smaller book is that it’s the ideal size to throw into a purse or diaper bag so your child can have it wherever you go. Although this book is recommended for children ages 2-6, parents find this book is fun to read to their infants also. Open The Barn Door is an enjoyable interactive book that will introduce your child to different farm animals in a peek-a-boo kind of way. It’s a perfect book for you to read to your child or for beginner readers to read on their own. Lots of fun to read! Young children love to explore the world around them by using all 5 of their senses. This Touch And Feel:Farm board book will allow your child to learn a bit about different farm animals through their sense of touch as well as their sight. Each page of this cute book features a different farm animal that has a different texture to explore. Kids love feeling the animals and learning to associate that feeling with the animal’s name. While this book is recommended for children ages 2-5, younger children will enjoy looking at the different animals and feeling the different textures also. The book is about 6 inches by 6 inches, which is a nice size for small hands to hold and handle and makes it a great on-the-go book. It comes in both hard cover and as a board book, with a board book being ideal for younger children as the pages are sturdier and easier to turn. This Touch and Feel: Farm book along with other books in the Touch And Feel series makes a great addition to any toddler’s library. What do animals on a farm do all day and night? The Big Red Barn attempts to answer that question and give your child some beginner insight into the behavior of various farm animals. Written in a simple rhyming text with nice pictures, Big Red Barn is a delightful way to introduce animals and reading to your toddler. The book comes in hardcover, paperback and a boardbook and it’s recommended for children 2 to 3 years of age, but even much younger children can enjoy looking at the pictures and listening to the soothing rhythm of the rhymes. Rhyming books make for a great introduction to poetry and music without your child being aware of it. They also make great books for beginning readers as well. 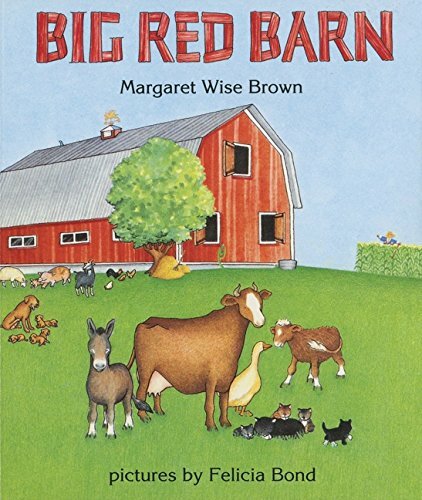 Big Red Barn is especially nice because the text is simple enough for young readers while the pictures of the various animals and scenes of a farm are sure to hold the attention of children not yet ready to read. And what child wouldn’t love a glimpse into how animals play and where they sleep? A fun and interesting book for toddlers, Big Red Barn is sure to get your child excited about the world of books and what can be discovered within their pages. Almost all of the farm toys we have selected can be added to with various types of accessories to make playtime more fun and interesting for your toddler. We take the same great care when choosing toy accessories as we do with the main toys because we always want to provide toys that are safe for your child and that will give you the best value for money. 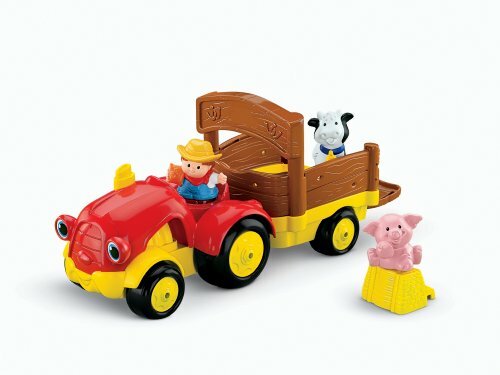 If your toddler is into farms or farm animals, then this Fisher-Price Little People Farm Animal Friends makes a great gift. 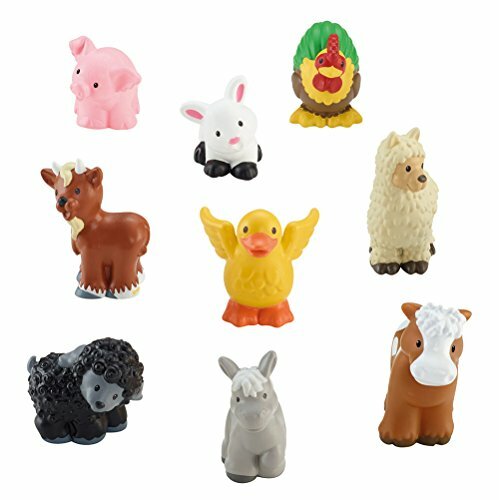 This farm toys accessory set has 9 adorable animals including a turkey, a pig, a sheep, a duck, a goat, a bunny, a donkey, a Llama, and a horse. These cute little animal play figurines are safe for toddlers and highly detailed. 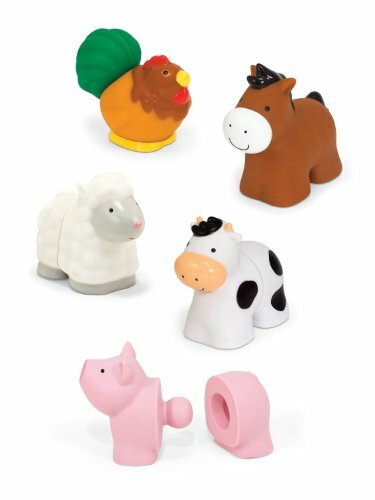 They make a perfect addition to any Little People farm set, as topper decorations for a birthday cake, stocking stuffers or as reward gifts. Recommended for children age 1 to 5 years, parents find these animals suitable for slightly younger children who love animals and are thrilled when their child learns to name and make the sounds of each animal in this set. 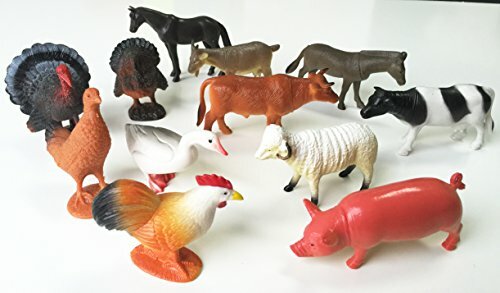 The chunky design of these little animals make them easy for small children to grasp, and your child will enjoy scattering these animals around their farm, feeding them, running them around the farm, riding them in trailers and any other activities that springs to their active imaginations. 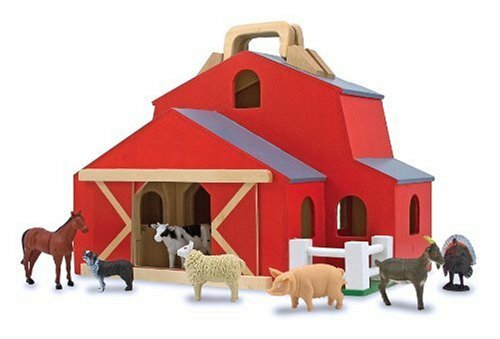 This is a great little farm animal set for toddlers and preschoolers who like to stretch their imaginations. These Little People Farm Animal Friends are perfect for toddlers who love animals or are little farmers or vets at heart! 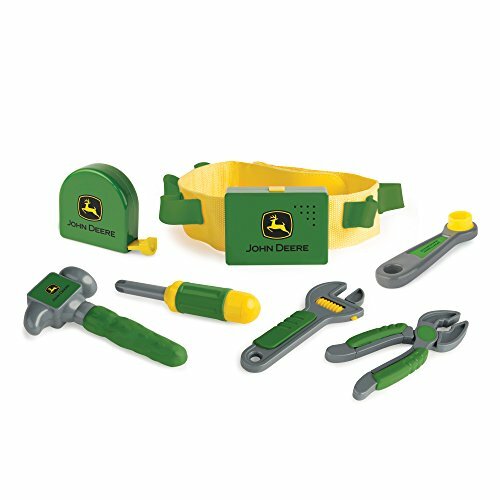 If your child loves to help you make repairs of any kind, they’ll love this awesome John Deere Deluxe Talking Toolbelt! This fun toy comes with an adjustable belt, a talking belt buckle, and a selection of tools, including a hammer, a screwdriver, pliers, a wrench, and more. The belt has a slot for each tool which helps keep everything together and minimizes the chances of one of the tools getting lost. All the tools are soft sided and the perfect size for small hands to hold while making “repairs”. Kids love that they can press a button on the belt buckle and hear two different phrases and three fun tool sounds. And a number of parents stated that it was loads of fun watching their little one use this talking toolbelt to “repair” different things, such as their John Deere ride on tractors. Made by TOMY Toys, this John Deere toy toolbelt is a great way to familiarize your toddler or preschooler with common household tools. It’s also an ideal way to cultivate your child’s interest in building and repair. It requires 3 AAA batteries (included) and although it’s recommended for kids 2 and up, many parents said it was great for their 1 year old also. This John Deere Talking Toolbelt is sure to please any little handy man or woman on your shopping list, bringing them hours of fixing fun! Kids think it’s lots of fun to play with! These cute little Melissa & Doug Pop Blocks Farm Animals are a great way to introduce your child to common farm animals. This set consists of five 2-part animals that snap together and include a chicken, a cow, a pig, a sheep, and a horse. The delightful animals connect together by a knob and socket closure. Every socket piece will fit with every knob piece so your child can mix and match the pieces to make their own strange and funny looking animal creation. . Recommended for kids 6 months to 2 years, these Pop Blocks are BPA, lead, and Phthalate free and can be played with in the bathtub or pool. They snap together easily and they’re large and sturdy making, them easier for small hands to grasp. And they’re ideal for animal identification, teaching animal sounds, color identification and to help develop your child’s mixing and matching skills. Babies like the textured patterns and mouthing these adorable little animals, while toddlers enjoy all types of pretend play fun they can have with them. and these is sure to amuse your little one and aid them in basic learning skills necessary for growth. These Melissa and Doug Pop Block Farm Animals are great little toys that help introduce common farm animals to your child while providing them with loads of fun. Lots of fun to play with! This delightful Shleich Feed Set will give your little animal lover everything they need to feed and take care of all their farm animals. Each of the 16 pieces is hand painted and very realistic looking. The set comes with feed crates, apples, carrots, oats, pellets, a straw bale, a hay bale, a pitch fork, and a broom. It’s a great addition to any child’s farm toy collection and allows your child to extend their pretend play chores to include feeding the animals. It’s also lots of fun to load the different items into toy tractors, trailers, and trucks so they can be hauled around. Designed to be an accessory to the Schleich World Of Horses, this set also goes well with other farm toy sets, such as the Melissa & Doug Fold & Go Barn. This feed set is recommended for kids 3 years and up, quite possibly due to the small size of some of the items. For example the feed sacks are only 1 inch tall and the hay bales measure about 1 inch X 1/2 inch, making them a potential choking hazard for kids who tend to put things into their mouth. But if you don’t have to worry about that, this Schleich Feed Set is a great accompaniment to any toy farm set, and it’s sure to add loads of fun to your child’s pretend farm play! This Big Bucket Of Farm Animals will make a wonderful addition to your child’s farm toy collection! One of the things young kids love most about playing farm is having lots and lots of animals to play with. This set contains 50+ pieces, including animals and other items that will add lots of fun to your child’s farm play. Along with animals such as cows, horses, chickens and pigs, this Big Bucket also comes with fences, troughs, hay, fencing and lots more. There’s everything your child needs to build a huge farm and have tons of pretend play fun. The animals are in this set are just the right size for small hands. The smaller animals stand about 2 to 3 inches high, while the larger ones are about 4 or 5 inches tall. All the pieces are very sturdy, BPA free, and come in a handy bucket that makes clean up and storage really easy. Although this set is recommended for kids 4+, many parents state that it’s suitable for children as young as 2 years old. All you have to do is remove the smaller pieces that may pose a choking hazard. With this Big Bucket, your child will have a great time putting the cattle out pasture, building a horse corral, and scattering the chickens around the barn yard. If your toddler has a toy farm collection they’d like to add to, this Big Farm 24 Pack Of Small Square Bales will make a great addition! 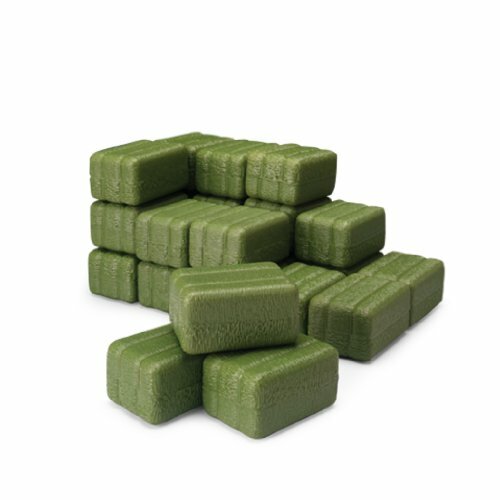 Made of high quality plastic, each of these cute little bales measures 1 1/2″ X 3/4″ X1″. Plus they’re compatible with John Deere Big Farm vehicles, such as the Big Scoop Tractor and the Skid Steer Set. There are enough bales to make a nice enclosure for your child’s farm animals or to use them to pretend to feed the horses or cattle. And kids really enjoy picking up the bales and loading them into a toy tractor, truck bed or wagon to haul around. These bales are recommended for kids 3+ but may be suitable for younger children who are past the stage of putting things in their mouth. These hay bales are a great way to add to your child’s growing farm set, giving them additional ways to engage their imagination while playing with their farm set! This Schleich Paddock Fencing can add a whole new dimension to your child’s farm play fun and help bring their imagination to life! The set comes with 12 fence pieces and connectors and each piece of fence is about 2 ¾ inches tall and 6 inches long. All the pieces are easy to snap together and take apart so your child will have no problem making pens and corrals of different sizes and shapes. Farm animals need to be fenced so it’s only natural that your toddler or preschooler will want the proper fencing to keep their farm animals safe and sound. 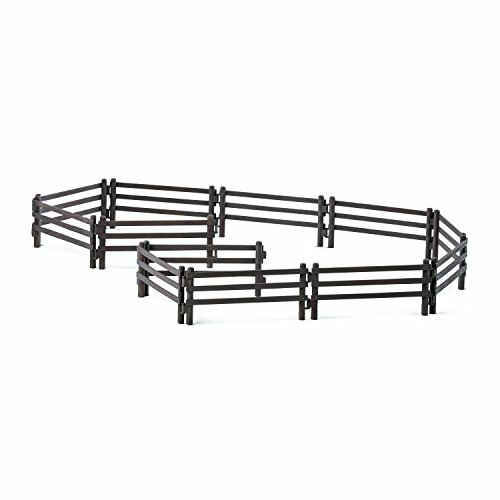 Kids love using Schleich’s Paddock Fencing to corral their horses, sheep, pigs, cows, and more. Most parents are surprised at how much this simple fencing adds to their child’s enjoyment of their farm or barn set. It’s seems to take their imaginative play to the next level and will add hours of entertainment to your child’s farm play fun. It’ s amazing how many uses kids find for this fencing! If you’re looking for a great gift that will add tons of fun to your child’s collection of farm animals, this 12 piece set of Large Farm Animals definitely fits the bill! The set includes 2 horses, 2 cows, a sheep, a goat, a duck, a hen, a rooster, 2 turkeys, and a pig. Each animal is approximately 3 to 5 inches in size and quite realistic looking. They’re ideal for imaginative play and your child will love finding all kinds of creative ways to use these farm animals. Whether they’re walking them around the farm yard, herding them into corrals, or putting them to bed in their pretend barn, the possibilities are endless! Although they’re recommended for kids 3+ years old, many parents find that these animals are suitable for younger children also, as their large size ensures they’re not a choking hazard. These Large Farm Animals by GiftExpress are a great addition to any farm set and they’re sure to add to your child’s enjoyment and pretend farm play fun. Kids think they’re lots of fun to play with!